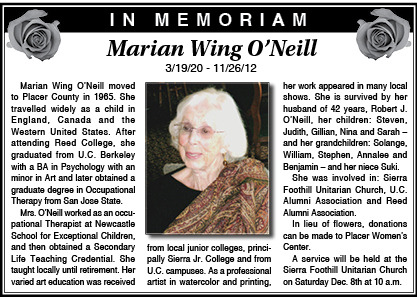 Marian Wing O’Neill moved to Placer County in 1965. She travelled widely as a child in England, Canada and the Western United States. After attending Reed College, she graduated from U.C. Berkeley with a BA in Psychology with an minor in Art and later obtained a graduate degree in Occupational Therapy from San Jose State. Mrs. O’Neill worked as an occupational Therapist at Newcastle School for Exceptional Children, and then obtained a Secondary Life Teaching Credential. She taught locally until retirement. Her varied art education was received from local junior colleges, principally Sierra Jr. College and from U.C. campuses. As a professional artist in watercolor and printing, her work appeared in many local shows. She is survived by her husband of 42 years, Robert J. O’Neill, her children: Steven, Judith, Gillian, Nina and Sarah – and her grandchildren: Solange, William, Stephen, Annalee and Benjamin – and her niece Suki. She was involved in: Sierra Foothill Unitarian Church, U.C. Alumni Association and Reed Alumni Association. In lieu of flowers, donations can be made to Placer Women’s Center. A service will be held at the Sierra Foothill Unitarian Church on Saturday Dec. 8th at 10 a.m.